← Rhyl Amateur Swimming Club, the beginnings. 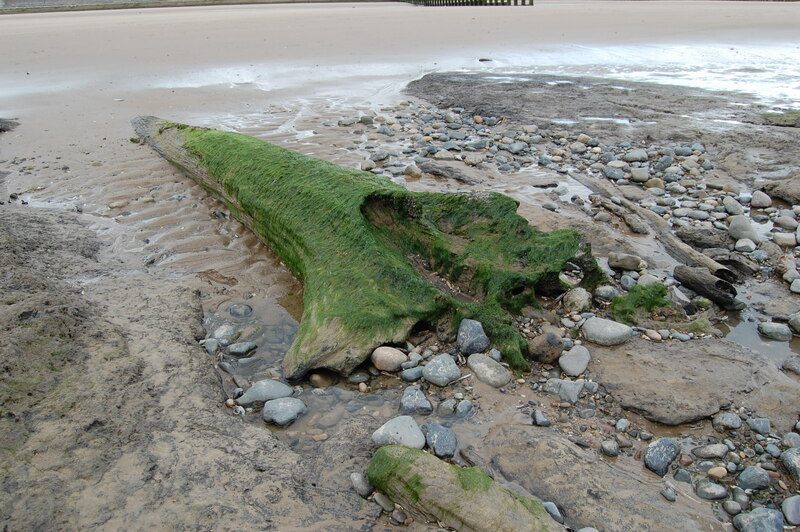 As children we were often told about the remains of a prehistoric forest under the sands at Rhyl. 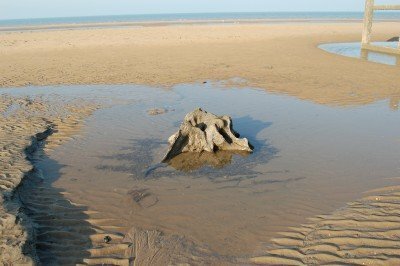 The tree stumps can sometimes be seen today, depending upon the tides. These are recent photographs taken near Splash Point. 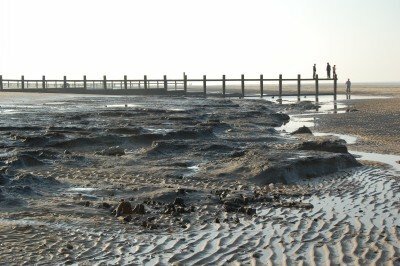 The tree stumps are rooted in peat levels lying below the marine sand and have been preserved by continuous waterlogged conditions. Confirmation of the existence of prehistoric man in this area was made by an exciting discovery on 28th March, 1926 of a Stone Age axe. The finder was Mr. T. A. Glenn of Abergele and he came across the axe on the sea shore near a tree stump of the ancient forest bed, a short distance east of Splash Point. The axe was of Graig Lwyd rock from Penmaenmawr measuring 8.5ins long and 3.125ins wide. This axe, together with a second axe which Mr Glenn found three weeks later, is now at the National Museum of Wales. The second axe was found landward of a strip of blue estuary clay, below high water mark, near Splash Point. It was slightly smaller than the first one and was again made from Graig Lwyd rock. 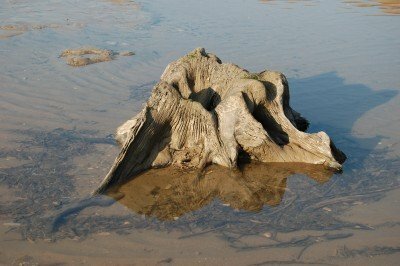 The action of the tide at Rhyl within the last few days has disclosed the singular sight of an ancient forest, which, for a period of eighty years has been completely covered by the sea. The scoured portion of the beach where the remarkable sight is presented is situated opposite the Marine Drive, about a mile east of the pier. The town surveyor Mr. R. Hughes has made an accurate plan of the place, which shows about thirty trees rooted as they grew, whilst there are a number of horizontal trunks which appear to rest as they fell. Several of the trees have been proved to be of oak and elm, and the remainder appeared to be birch, alder and hazel. The stumps vary in diameter from 12 to 24 inches, and are situated about 100 yards from the edge of the sandhills and are covered during high spring tides by about 10 feet of water. The scoured portion in the sands, which exposes these old roots, extends for about 550 yards in length and varies in width from 7 to 35 yards. Folk lore asserts that this is part of an old forest, the portion in question being known as “Coed Mawr y Rhyl”. The submarine forest comes well into view on the shore at the east end of the Rhyl promenade. In August 1918 the writer counted 100 stumps rooted in clay. In October 1912 Mr Glenn counted 200 between Rhyl pier and about half way from the east end of Rhyl to the centre of Prestatyn. The belt exposed was 60-70 yards wide. This belt was also exposed in February 1893 and consists of birch and Scotch fir chiefly, and oak, hazel, elm and alder. An interesting article and gives me another bit of history of my great-grandfather R. Hughes, surveyor of Rhyl. Having read this article I thought you may be interested in my experience. In the early 80’s I was metal detecting, just off Splash Point, During my searches by the Old Forest I got a signal amongst the mud/clay in a pool and whilst digging out the find I knocked what I thought was an old forest branch. I cleaned it in the pool and I had found a deer antler. Knowing the history concerning the area I was stunned. I contacted the County Archeologist who came to my house and he examined the find and asked if he could take it away and fully research it. 10 days later he returned with full provenance and date. It is between 2,000 and 5,000 years old. I was asked to mark out the area where it was found on a map for the record. He also said it would be recorded in The Modern Version/Edition of The Doomsday Book. 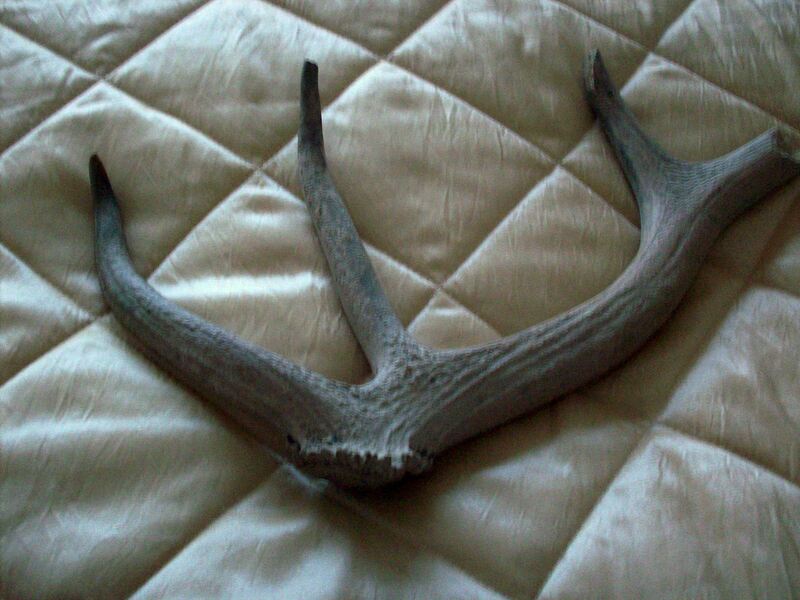 I have sent a copy of a photo of this antler to a member of the History Club who deals with the website I believe. There was an article and photograph taken of this event in The Daily Post dated Wednesday January 18th 1984 written by Richard Simpson.This whole area I find fascinating and go down to the beach often to see the changes. Thanks very much Paul, very interesting. How big is it? What does it measure across it’s widest point? I have visions of people descending on the beach after reading this, spades in hand! The antlers are 16″ across the widest part and 12″ tip to the joint where the antlers were attached to the deer. There are three perfect points and the tip of the fourth is broken off . I am still amazed at its condition after all these thousands of years. So, I get the metal detector bit, but how does the device find an antler ? maybe a rush on metal detectors now. HI Andrew, the device did not detect the antler!! It detected a metal object and whilst I was searching for that, I unearthed the antler amongst the mud!! Hope that clears that matter up for you! I well remember that before the promenade was extended from Splash Point to Prestatyn, c1945/6, the black remains were always visible. I suppose that with the new sea wall being built, there must have been a build-up of sand over it. Keith Hackney, New Zealand. There isn’t much exposed there at the moment. I don’t suppose you have a copy or know where the original is of R. Hughes’s map of the forest?